Ask my husband what I would eat every night if I could and the answer would unquestionably be pizza. I *love* pizza. There’s something so beautiful about hot, bubbly bread topped with copious amounts of cheese and fresh, fragrant basil. It smells incredible, looks beautiful, and is inevitably a people pleaser. So tonight, as I left with bags full of fresh fruit and vegetables from a local produce stand, I began brainstorming what I could possibly use my fresh zucchini, tomato, and corn for this evening. Fun game right? Vegetable salad? No. We had that last night. Caprese? No. We have that at least times a week. I got it- HOMEMADE VEGETABLE PIZZA. Yes, definitely. 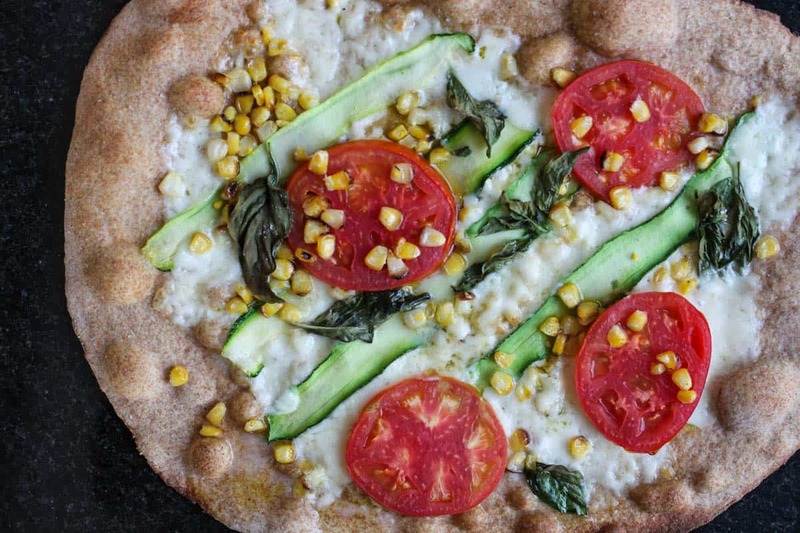 You’re going to love how easy this homemade vegetable pizza is. I started out with a crust recipe from A Bountiful Kitchen’s homemade margherita pizza (makes two 10-12 inch thin crusts) but subbed wheat flour for white, because in all honesty- it’s all I had. And it turned out dang good. 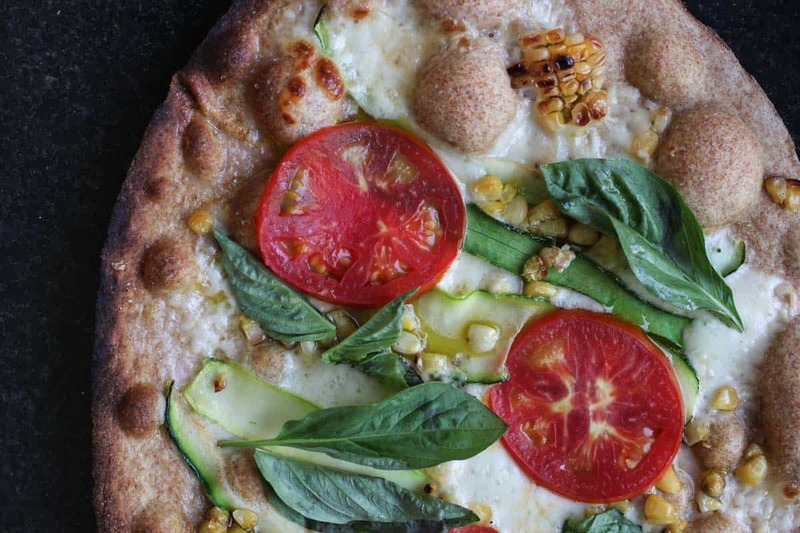 After mixing your dough together, prepare your veggies while your dough rises. 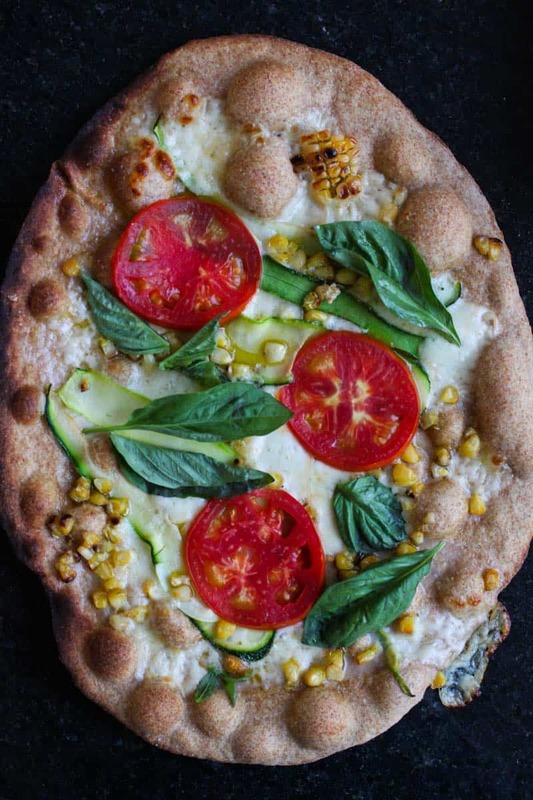 Chop the tomatoes, slice zucchini with a vegetable peeler, cut your mozzarella into thin slices, and if you’re feeling overly ambitions, grill your corn. I brushed two peeled cobs with olive oil and grilled them until the kernels turned dark bubbly brown. It was pretty darn easy but if you’re looking for a quicker substitute, you can buy a bag of frozen pre-grilled corn from Trader Joe’s. Because they’re just that handy. 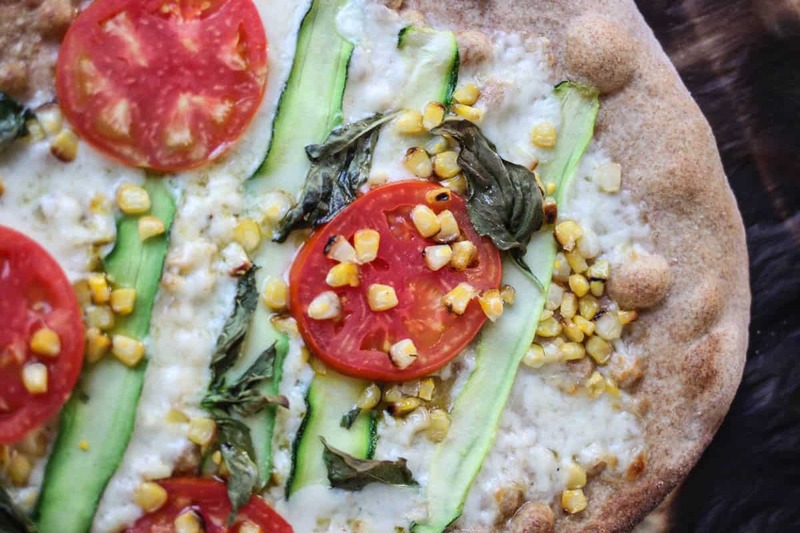 Half the dough into two portions, use a rolling pin (or your hands if you’re uber talented like that) to shape your pizza, top with olive oil, then mozzarella, then vegetables. And don’t you dare forget the salt on top. 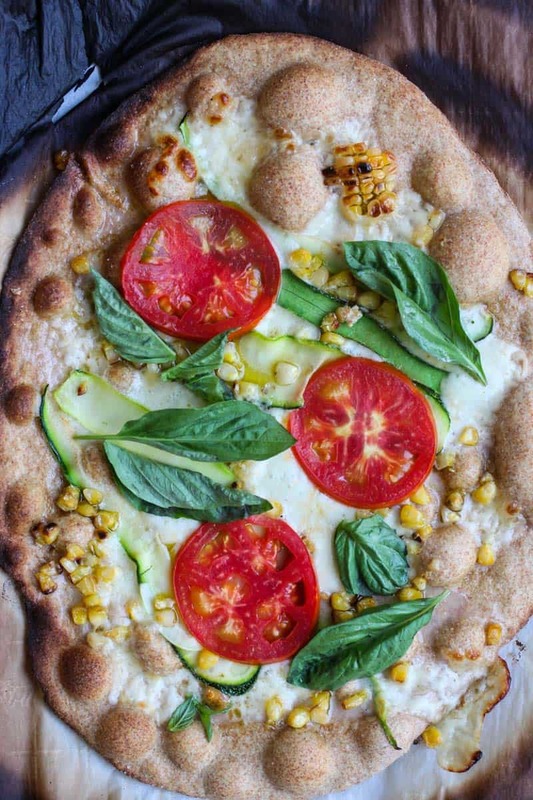 Basil can be topped fresh or cooked with this homemade vegetable pizza. I’m a little partial to cooked myself. Enjoy! Preheat oven to 500 degrees for one hour (same amount of time that the dough needs to rise). Pour 3/4 cup warm water into small bowl; stir in yeast. Let stand until yeast dissolves, about 5 minutes. Sprinkle with about 1/4 teaspoon sugar, to help yeast grow. Brush large bowl lightly with olive oil. Mix 1 1/2 cups flour, sugar, and salt in processor or Kitchen Aide. Add yeast mixture and 3 tablespoons oil; process until dough forms a sticky ball. Slowly add remaining flour. Transfer to lightly floured surface. Knead dough until smooth, adding more flour by tablespoonfuls if dough is very sticky, about 1 minute. Transfer to prepared bowl; turn dough in bowl to coat with oil. Cover bowl with plastic wrap and let dough rise in warm draft-free area until doubled in volume, about 1 hour. PUNCH down dough. Start in center of dough and roll out, working outward toward edges . Place rolled dough on top of parchment paper and coat dough surface with desired amount of olive oil (I used 2-3 Tbs. per pizza). Sprinkle cheese on top, then arrange vegetables over cheese. Sprinkle entire pizza with salt. Top with fresh basil. 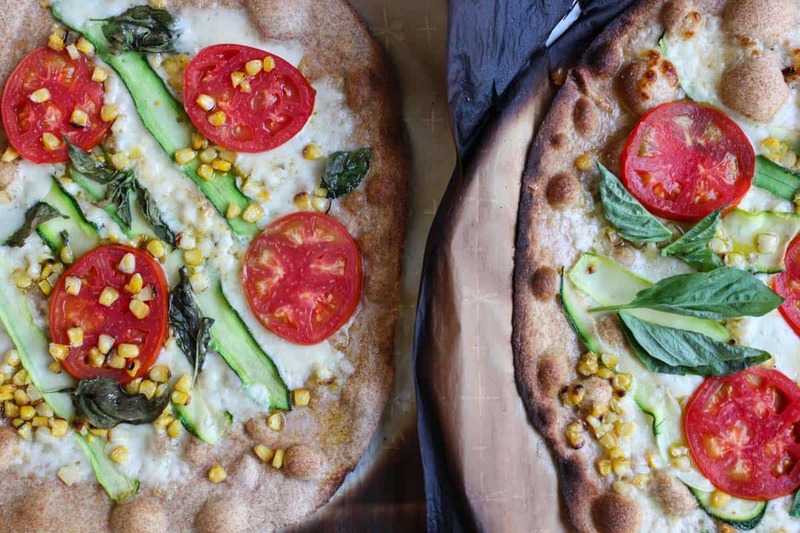 With the parchment paper still beneath the pizza, cook on cookie sheet or pizza stone (preferred) for 3-5 minutes, or until edges are crisp and bubbly, and bottom is browned.